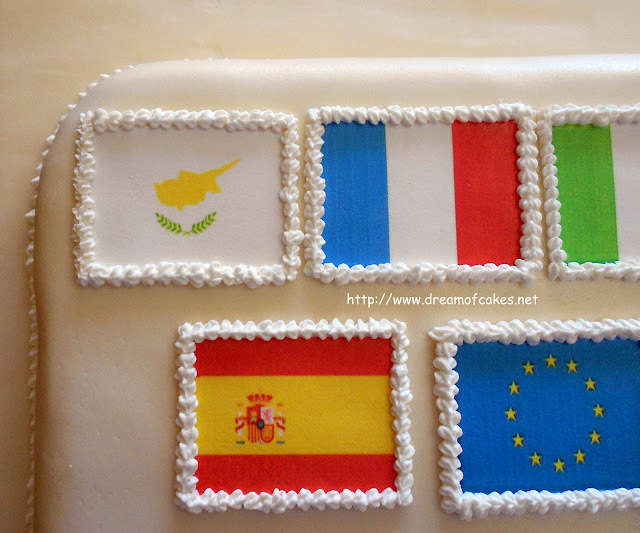 Approximately one month ago, my friend Olympia send me a message asking me whether I could create a cake decorated with eleven flags, for a dinner party that was going to be held in a hotel in Limassol. 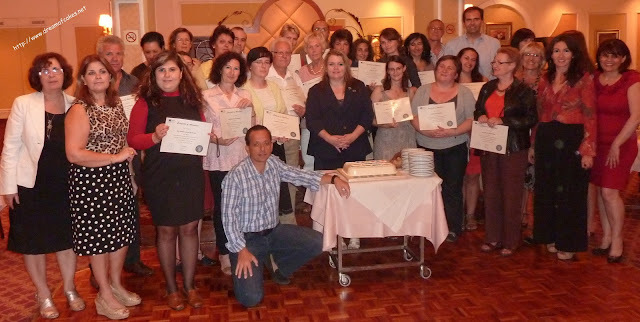 The dinner was held for teachers that took part in an educational seminar. The theme was POETRY, which stands for Pieces Of European Treasure Recited by Youth. Actually below you can find all relative details concerning POETRY. "POETRY: Pieces Of European Treasure Recited by Youth" is Comenius Project which aims to motivate students to become more interested in their own country’s traditional and modern anthological treasures and share them with their fellow students in the rest of Europe. The ten partner schools are located in Cyprus, Lithuania, Spain, Belgium, Romania, Estonia, Italy, France, Poland and Portugal. The students taking part are 15 - 19 years old. The participants will be involved in a variety of activities. As the project progresses, they will interview writers, poets and historians. They will prepare videos, leaflets, calendars, attend lectures and book presentations. They will visit museums, conduct their own researches in libraries and on the internet, participate in artistic competitions. They will write essays, poems and songs. 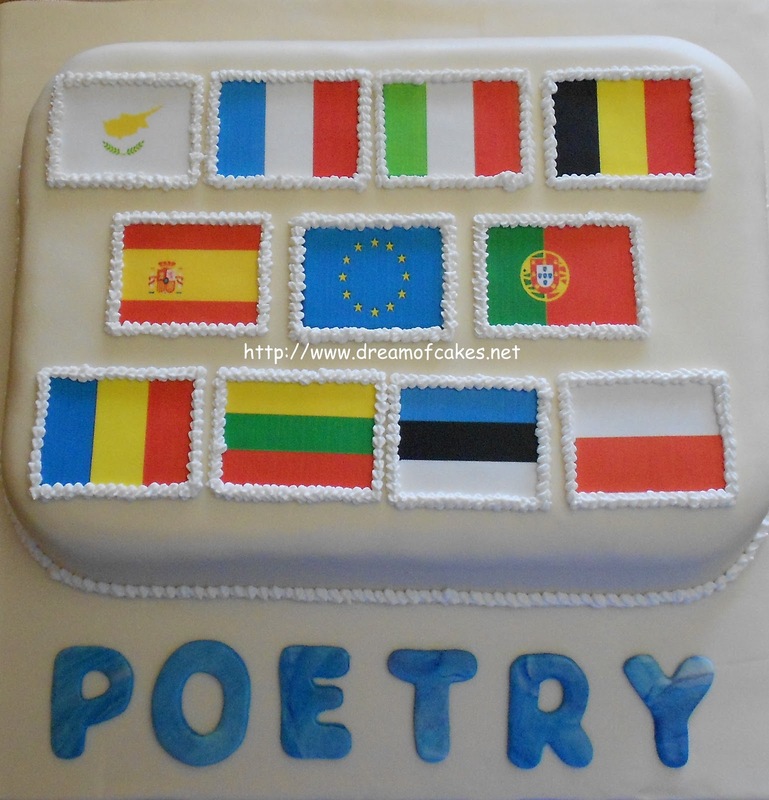 The POETRY website will be the main method of dissemination of our work and the place where all the students will meet, exchange ideas, throughout the course of the project, and become friends. The climax of our project will be the "POETRY Night Live" where students will perform their own creative work, their poems and songs and share them with the public. Protecting and preserving our common cultural heritage is every European citizen's responsibility and duty. Hopefully, by the end of this project, our students will be well aware of that, and ready to contribute in achieving it! Kudos to Europe for making heritage and the arts such an important part of schools! This cake is a wonderful reflection of the theme/program. Well done, Efty! Great work, it's a piece of art. You sure have a lot of patience to work on those small details on your cakes. I am inspired to try to bake something myself. Thank you Efty! Great cake for a great educational program. Congratulations! Efty, you're good, loves all your creative cakes. What a pretty cake - and the research that went into it to get the flags just right is incredible! You did a terrific job and I bet they were thrilled with it! Eftychia - I could hardly believe these are cakes! Hi Eftychia! thanks for dropping by at my blog. Wow ur cakes are so coloreful and Perfect. this cake is awesome! I love the theme! Hi Eftychia, thanks for visiting my blog! Love the flag cake, were the flags made from edible printing? Hi Sharon, yes the flags were made from edible fondant printing. You're a genius! everything you made is beautiful! I have too much to learn from you, love to make cakes but I have not the magic touch like you! congratulations! Hello Poland (no name mentioned...) Thank you so much for your comment! I am very pleased you liked the cake! Wow, this cake is absolutely amazing. The thought that was given behind it to actually be made to what it is now, it is incredible. The people that worked on this cake are geniuses. Anyone that sees this would love it and just smile, from the flags to the colors, and the word poetry at the bottom. Which stands for Pieces of European Treasure Recited Youth. Absolutely Genius. The cake is as beautiful as what is a the heart of the Comenius Project! It reminds me of the pluralistic society model noted as an educational trend in Prof. Neo's Dev Psych class. The students from diverse European cultural groups involved in the Comenius Project have a wonderful opportunity to explore their cultures' poetry and share it. I believe this will help participants preserve the cultural features unique to each country and learn about those of the other countries involved. This is a great experience and will enrich and broaden the experience of subcultural heritages for students as well as teachers. As a result, all involved will no doubt have a better understanding of the participating European countries, gain greater sensitivity to the values and needs of those from the countries represented in this project, and make dear friends. A truly beautiful work of art and heart! Brilliant Concept, Its a Great way to reinforce ones Heritage which the Comenius Project offers, Not to mention the experience these students with embark during this experience , just one of the many during their lifespan development. Interviewing poets, historians , research, and sharing it. It definitely is a wonderful way to understand the psychology of others and also gain a better understanding of ones roots. It really is a fine way to preserve heritage all the while long educating yourself as well as others. Very interesting Dynamic. This cake is visually captivating to any audience. It is always refreshing to see adolescents expressing their thoughts in such a productive way, without fear of embarrassment or criticism. This is the great thing about poetry in that a person is able to illustrate different aspects of their culture and life experiences through their writings. This project is proactive and intellectually productive for these students because it encourages them to express or exchange traditional and modern stories from their country, while learning about others as well. This is a pivotal phase in their developmental psychology; which is instrumental to their growth and future social relationships. Beautifully done cake, (and might I add looks delicious)! I really appreciate the concept that POETRY is aiming to achieve. I think that it is a rare but wonderful opportunity these students are being offered because it pulls them away from today's distractions to let them express themselves in their own creative forms with poems and songs, but also allows them to refrain from using internet secondary sources and allows them to interview a primary source. That is something that many students, unfortunately, do not have the opportunity to do, and by doing so these students can enhance their cultural diversity. This program serves as an excellent introduction and preparation for a culturally rich life and provides them social opportunities that they can enjoy.